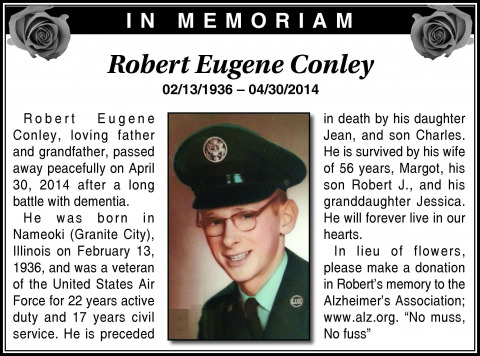 Robert Eugene Conley, loving father and grandfather, passed away peacefully on April 30, 2014 after a long battle with dementia. He was born in Nameoki (Granite City), Illinois on February 13, 1936, and was a veteran of the United States Air Force for 22 years active duty and 17 years civil service. He is preceded in death by his daughter Jean, and son Charles. He is survived by his wife of 56 years, Margot, his son Robert J., and his granddaughter Jessica. He will forever live in our hearts.